It’s amazing how much stuffs my stomach can store. It’s a joyous occasion anyway, shall not grumble much. Did nothing but eat all day. The couple had the usual march in, thank you speech, photo taking session. Not sure if it was forgotten, there’s no “yum seng” session. In traditional wedding dinners/lunch there’s always a “yum seng” or wedding toast, where family members will go up on stage, standing next to the couple, proposing toast to everyone. Hm…not sure if it’s supposed to be toasting to congratulate the happy couple or meant for the family to toast and thank the guests for attending the wedding. There’s about 7 or 8 dishes (not the full 10-course),I doubt I can finish full a 10-course lunch. It will be so filling. I had a bit of everything, because right after the wedding lunch, we need to go for High-Tea buffet celebrating his mama’s birthday… Overall, food was not bad, service was good. Lunch starts around 1 and ended around 3.15pm, pretty fast ya. There’s already a banquet rate table circulating around in the internet, probably you can take a look if you are getting married next year. It was raining in the afternoon, so we took train to Orchard instead. 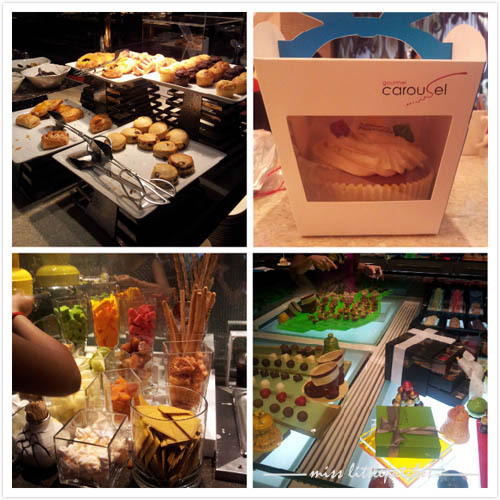 I’ve made reservation for High-Tea buffet at Carousel @ Royal Plaza on Scotts. Been there twice and food was not bad. His mama seems to like that place too. High-Tea buffet starts at 3.30pm, we reached there at about 4plus. Asked the supervisor/manager about my reservation and she showed us to our seats. While walking in, she asked if we are celebrating someone’s birthday. I can’t remember if I state the reason of dining while filling up the online reservation form, but it did surprised me. Their staffs came around to sing birthday song with a small cake. There’s quite a wide selection of cuisines to choose from, Asian, Japanese, Seafood spread, Desserts, Pastries, etc. There’s 3 dessert stations I think – ice cream, chocolate fondue, cakes.. Oh my…I’m still very full from the wedding lunch. 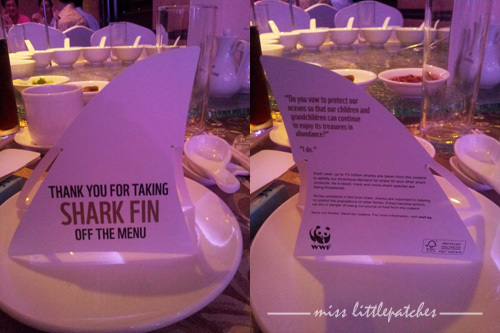 Sad… I only had Salmon, Tuna, Prawns, pastries… His uncle had Nasi Lemak, the chili looks and smells nice…. For 17 adults and 1 children, the bill add up to around S$700+, after some credit card promotion discount I think. Weekend High-Tea for adult is S$38.00++. You can check their rates here.